Egypt's Shura Council, the upper, consultative house of parliament, announced on Tuesday the names of new editors-in-chief for state-owned newspapers and all affiliated publications, in the first reshuffle of official press positions since the inauguration of President Mohamed Morsi. Journalist Abdel-Nasser Salama was appointed editor-in-chief of Al-Ahram daily newspaper, while journalist Gamal Abdel-Rahim was appointed as the editor-in-chief of Al-Gomhouriya daily newspaper and journalist Mohamed Hassan El-Banna as the editor-in-chief of Al-Akhbar daily newspaper. Soliman Qenawi was also appointed as the editor-in-chief of the Akhbar Al-Youm weekly newspaper. The appointment of Abdel-Nasser Salama was shocking to many journalists and revolutionary activists, as he is known for his counter-revolutionary views. Activists shared articles of Salama that date back to February 2011 accusing protesters in Tahrir Square of being funded by foreign embassies. During the Cabinet clashes between protesters and security forces in December, Salama accused protesters in his op-eds of being thugs who should be stopped at any cost. Christian activists were also shocked by Salama's appointment at Egypt's biggest newspaper. In November 2010 during sectarian clashes between Christians and security forces in Omraniya, he published an op-ed attacking Christians and late Pope Shenouda III in an offensive way. Al-Ahram daily later in a very rare occurrence issued an apology to the church and the late pope. Since the 18-day uprising, Al-Ahram daily has seen three editors-in-chief come and go. Abdel-Rahim, a former member of the Press Syndicate Council, caused controversy in the past with his stance against religious freedoms in Egypt. In 2008, Abdel Rahim stopped a conference about religious freedoms in Egypt because it discussed the issues of religious minorities, notably Baha'is in Egypt. Well-known Baha'i activist Basma Moussa filed a complaint against Abdel-Rahim in 2009, accusing him of calling for her murder on air during a television programme discussing the rituals and traditions of Egypt's Baha'i community. During the programme, Abdel-Rahim said Moussa should be killed because she is a Baha'i. That same year six human rights organisations accused Abdel-Rahim of inciting hatred towards Baha'is after he praised locals in Al-Sharoniya village in Sohag after their attack on the houses of Baha'is. 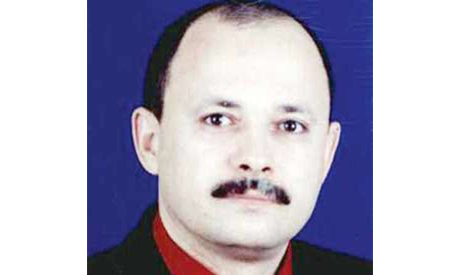 Abdel-Rahim used to attack adherents of Baha'ism in his column in Al-Gomhouriya daily newspaper regularly. Several activists and journalists have accused Abdel-Rahim of being close to the former Mubarak regime and State Security. El-Qenawi, the new editor-in-chief of the Akhbar Al-Youm weekly newspaper, is known to be an Islamist who used to head Al-Azhar Voice newspaper, a publication that comes out of Egypt's highest Islamic authority Al-Azhar. The Shura Council's mechanism for choosing editors-in-chief of state-run newspapers has recently caused a lot of controversy and anger among journalists in Egypt. In June, seven board members of Egypt's Press Syndicate withdrew from a meeting with the speaker of the Shura Council, Muslim Brotherhood MP Ahmed Fahmy, after objecting to the upper house's "excessive" interference in the Supreme Press Council, previously responsible for appointing heads of state-owned media institutions. The objecting board members demanded a new means of selecting key editors, in order to reduce the influence of Islamist forces that hold a majority of seats in the upper house. It's not unusual that, if I may say so, opposition figures hold key positions in a free public-service-media-system. But now they have to play the game according to a new democratic environment, otherwise they will be sacked. That's for all those accusing the Brotherhood for attempting to monopolise power. This proves that the Brotherhood has integrity and don't lock out opposition figures from the public-service-media-system.